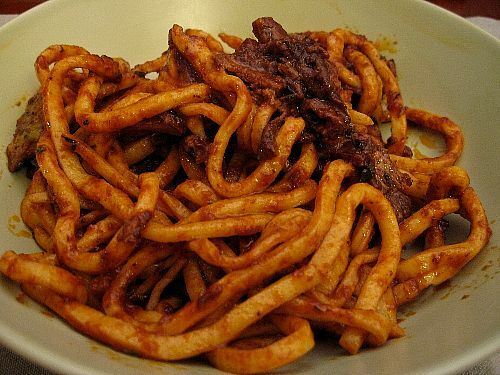 Outside Italy pasta is considered a highly convenient dish. With dried ingredients you can store for month, you can cook up a meal in a matter of minutes. Tasty, healthy, with a different sauce every night. The pasta recipes you find in Italian-language cookbooks are very different. Often they suggest you make your pasta from scratch, hardly a quick-fix lunch. 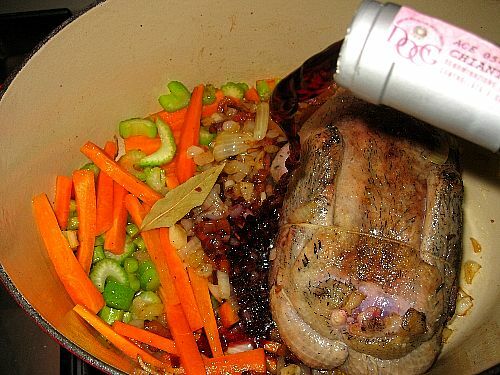 Sometimes they recommend you cook a stew separately using prized ingredients such as rabbit or game to serve as a sauce. I always wanted to try one of these recipes. My choice settled on the Pasta con l'anatra - pasta in duck sauce. 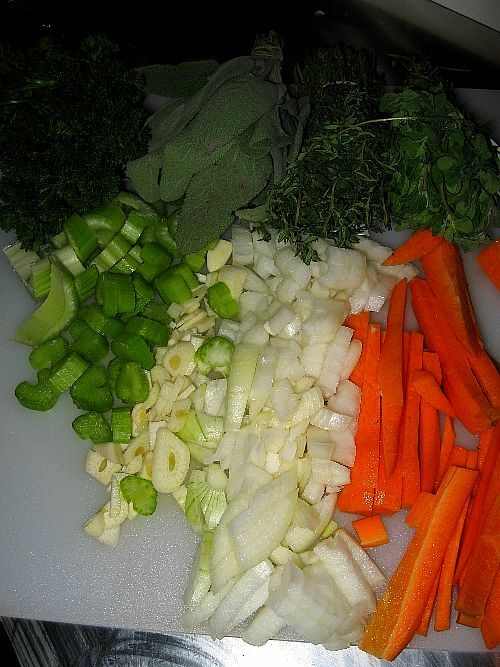 The sauce is a simple stew with chopped garlic, onion, thyme, sage, parsley, laurel, carrot, a celery branch, a duckling, guanciale, tomato puree and red wine. Fry them with some guanciale over a hot flame and add the duck. Wet with the red wine and give it boil. <>Meanwhile, I made the pasta itself, using my prized chitarra. They were a sort of obese tagliatelle, almost as thick as wide, made with as much hard-grain flour as my 4 eggs would take. 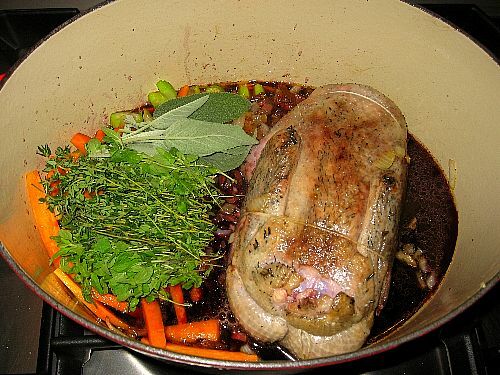 Leave the stew for about 90-120 minutes on the stove over a medium-low flame or as long as it takes for the duckling to be cooked through. Add water as required for the stew not to burn. 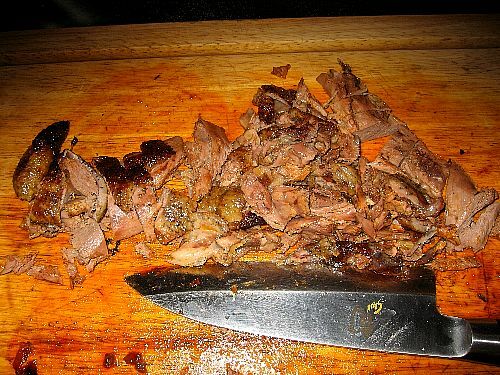 Fish out the cooked duck and lay it on a cutting board. Cut out all the meat and cut in bite-size pieces. 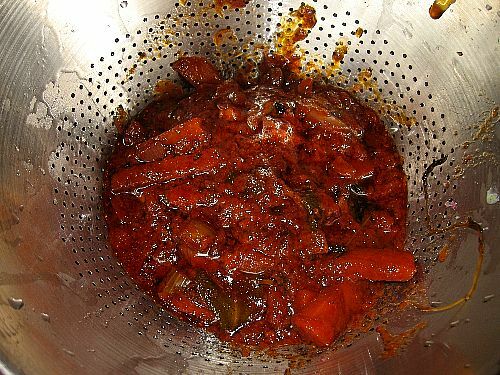 Pour the sauce in a sieve and filter. Return filtered sauce to the dish and decant it to remove the large quantity of duck fat. Here is the result, al dente pasta in a gorgeous sauce with a rich and complex taste. Unlike any pasta you can eat outside Italy and well worth the effort! Made this dish last night and it turned out so tasty! I can't believe how much fat comes out of that duck, but it was so tender and juicy. Thanks for the recipe! 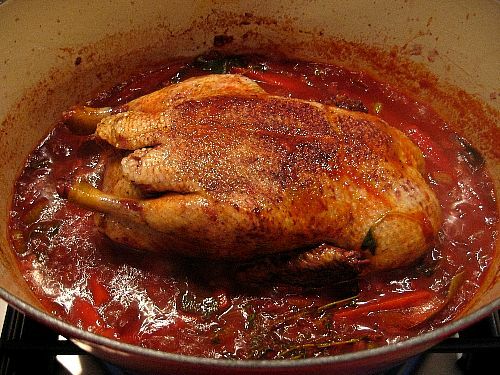 I'm glad you tried it, the duck does indeed render an enormous amount of fat and some modernized recipes recommend making it the day before so that you can leave the sauce in the fridge for the fat to coagulate and rise up to the surface to be spooned off the next day. Much lighter that way! Thuan, I used to cook in a cheap red enameled cast iron pot, but now I have graduated to an expensive (!) black Le Creuset cast iron pot, with no enamel at all. It is gorgeous and does not react with anything. I can warmly recommend it! Walter, duck fat is great for many things especially for potatoes, but the duck fat rendered by an actual duck in a pot is just not that tasty, at least compared to the roasted duck you eat with it. I must say I'd much rather buy the fat in a pot than make my own! Jeff tonight I'll make a French classic, peasoup. Duck confit I don't like but might one day cook a cassoulet or a garbure, both dishes use duck confit as an ingredient. 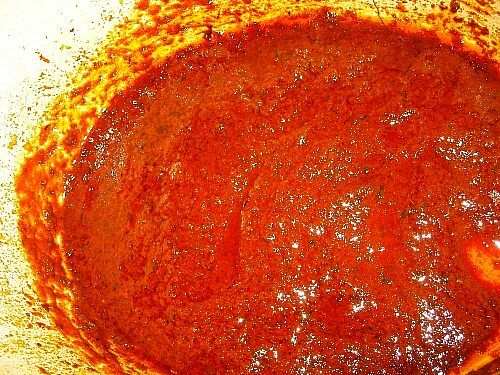 I noticed in another pasta sauce recipe using a large slab of meat as a base,it was recommended that it not be eaten with the sauce. 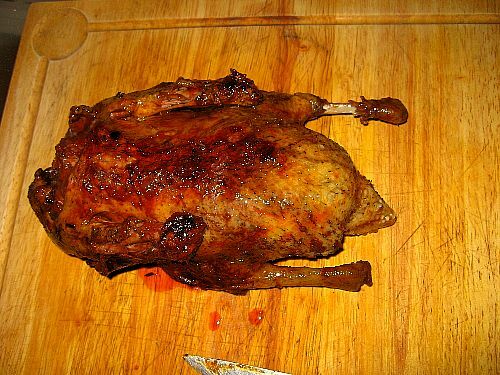 I am assuming that the duck in this instance was used with the sauce? FX's answer→ Faith, yes in fact there are several sauces that are flavored by the meat simmered in them, and the sauce is served with pasta as a first course, or in a separate meal from the meat. Ragù napoletano is one with a piece of meat, and if you look at my article Bigoli... you'll see one similar with the duck ragù, although I decided to serve the duck meat with the pasta. Hope this helps! Followed your recipe and made this last night with a wild Mallard duck hen, it was very very good. That's probably one of the richest tasting tomato sauces I've ever had! From the photos it looked like you had another herb that wasn't mentioned in the ingredients list, looks like either marjoram or oregano? I ended up adding some marjoram in our sauce.There wasn't much fat rendered out from our duck, but I think that's probably because being wild it was much leaner. 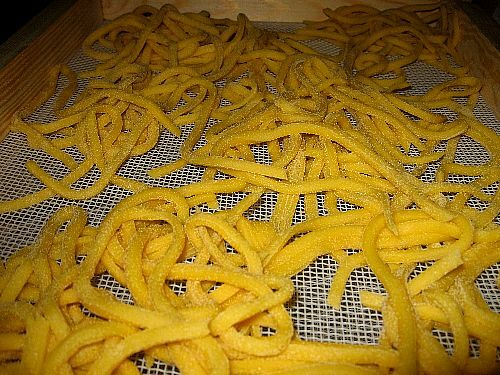 We made the pasta using the new chitarra I had gotten, another inspiration from this site. Thanks so much for the recipe and inspiration, I hope you'll find the time to do some new posts since they're always so fun and inspiring to read. FX's answer→ Thanks, indeed it makes for a fantastic pasta sauce. Wild duck - sounds really interesting. Wwhere do you work? I'm hoping to make this very soon. Do you remember the measurements for the ingredients you used? 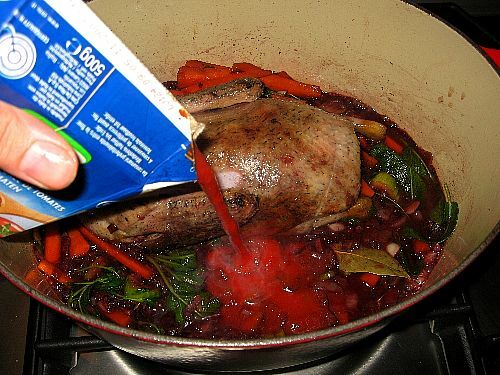 And I gather that the duck was cleaned but not cooked before it was added to the sauce? FX's answer→ Thanks this indeed is a memorable sauce. I was searching to find a chiatarra and came accross your recipe. It looks wonderful mostly because I love duck. 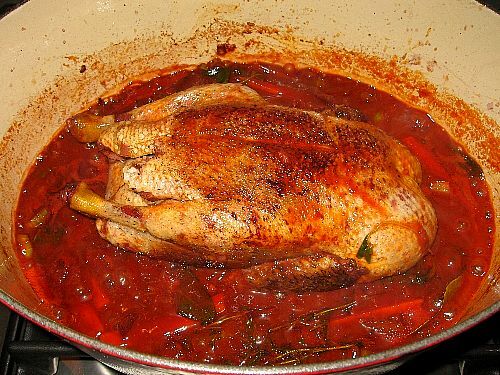 I have always wnated to make a game ragu such as wild boar but duck is easier to find. Maybe Silver Spoon has a recipe. 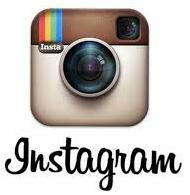 I am going to try what you did.